Acrylic Splashbacks for kitchens, luxury bathrooms & laundries in 143 colours or make up your own colour! WE SUPPLY AUSTRALIA WIDE FACTORY DIRECT. 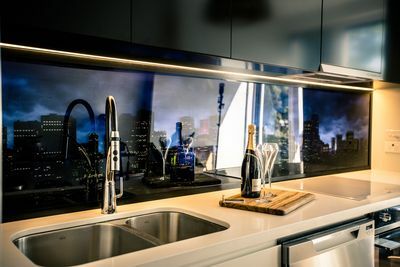 Supplying Acrylic Splashback & Polymer Wall Panels to Melbourne, Sydney, Adelaide, Brisbane, Perth, Tasmania, Darwin, Australian Capital Territory and the greater Australian regions. ISPS Innovations manufacture & supply a high range of custom designed and coloured splashback and wall panel alternatives. Being provided the correct information regarding product performance is crucial when choosing your substrate. So if you after an Acrylic Splashback or high heat polymer wall panel delivered, this is the right page! 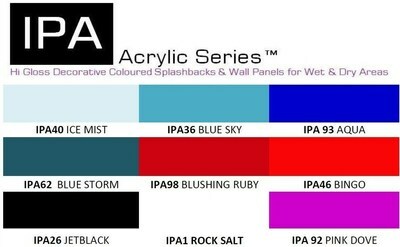 IPA ACRYLIC SPLASHBACKS COME WITH GRIPTEK BACKING! ISPS Innovations will beat any price on custom coloured cut to size 6mm Acrylic Splashback & Wall Panels(conditions apply). ISPS Warhouse prices are delivered to you. 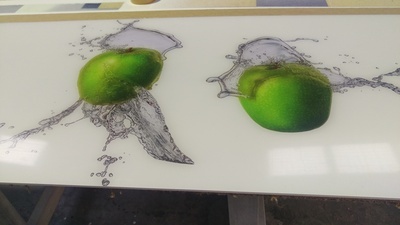 ISPS's innovative splashback polymer system is available in any colour, combination colour, ISPS EFX and digital print process. Colourback Acrylic Sheeting the sentiment of glass with out the cost. ISPS Innovations Splashbacks are the DIY favourite! DIY Splashbacks have never been so easy. See our nationally delivered acrylic splashback & acrylic wall panel pricing. Unlimited colours below. If you don't pick a colour below send us your colour choice by post & ISPS will make it! Colour is a key interior challange. Because of so many battles with custom colours on interior substrates, ISPS go one better and offer the service of colour matching by eye to reduce the headaches of buying out of the paint pot colours. The dissapointment of colour changes and variation because of light source or non preparation to substrates effect and change the desired colour. ISPS like to assist with critcal colour matching processes and require primary colour samples to achieve effective colour tonning and blending. So send us an apple, a door a pencil or any colour you like as long as it is a physical sample we will do our best to match, blend and tone. Our Innovative Splashback range is an engineered polymer customised to your specification. People ask is it Perspex? Just like PLEXIGLAS® or our IPA Acrylic it is a trusted brand with a different manufacturing process. This process has been designed to last weathering issues within the substrates ISPS supply. When you order with ISPS we provide a practice piece of acrylic splash for you to cut into. When you place your order and post a colour sample, ISPS will provide a free tube of neutral cure silicone with your order so you can start on your DIY splashback or DIY Wall panel. With our cut to size service installing your Acrylic Splashback will be an ease. 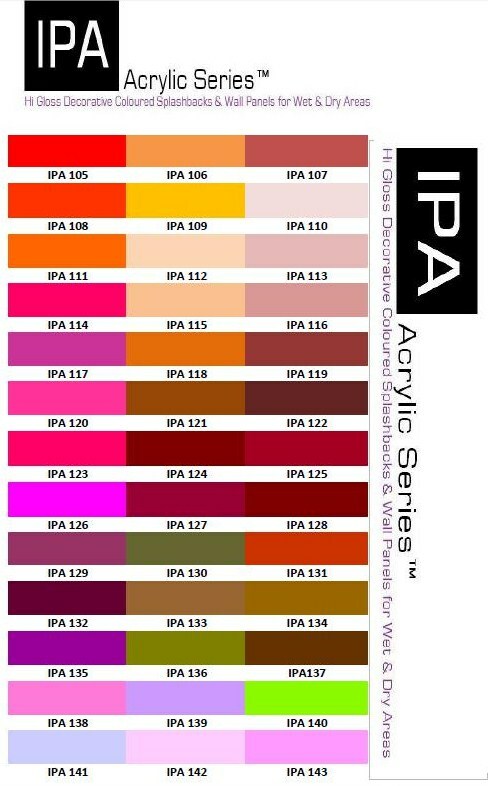 With IPA Acrylic sheets you can have any colour, shade or printed image with any colour backing. GripTEK is applied to IPA Acrylic splashbacks and panels, giving you unlimited choice. ISPS are the only company to provide GripTek backing with our Australian Made acrylic printed splashbacks and wall panels. ISPS supply nationally all over Australia direct to your door or pick up from our local depo in your state. Note colours vary from screen to screen. The colours below are used as a guide only. IPA Acrylic is the most cost effective, economical coloured Acrylic Splashback in any colour with a consistent high gloss finish that reflects the look of glass or satin finish. ISPS Innovations Acrylic has glass clarity. 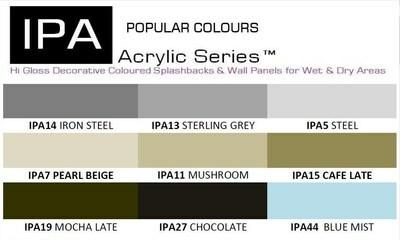 IPA Acrylic Splashbacks & Wall Panels, the economical high gloss alternative to Glass Splashbacks. 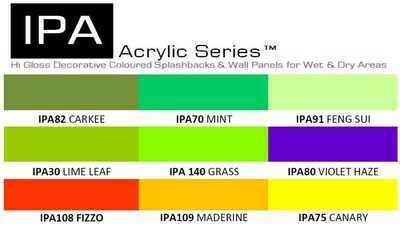 IPA Acrylic Splashbacks series is mould resistant & self polishing. Just follow our care instructions when cleaning. The High Gloss Face of our IPA Acrylic Splashbacks is hard wearing like pressed aluminium. A trade & shop fitters favourite! IPA Acrylic works exceptionally well in high traffiked areas, perfect for commercial & domestic application. IPA Acrylic Can be used as a whiteboard with the use of removable markers & double as a projector screen, saving you money. 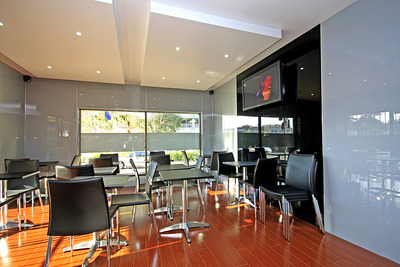 Perfect for Schools, offices, Boardrooms, Hospitals, Bars, Cafes, Restaurants options are endless. 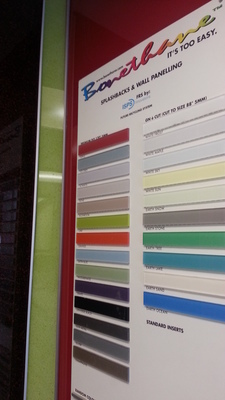 Available in 143 standard colours or choose any colour ....... great for Trade industry requirements. Fantastic for the clients that requires that particular colour, for corporate colour, franchise colour or the individual that is looking for a cost effective durable product that provides options. 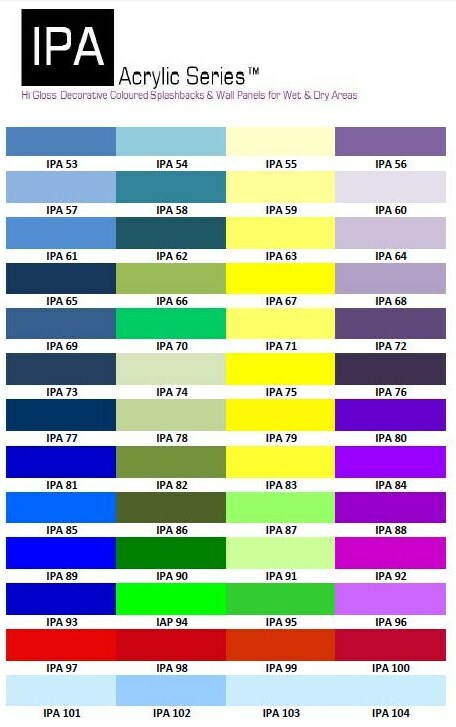 IPA Acrylic has a maxiumum heat temp abosrbtion of 100°C with continuos service temp of 80°C. Acrylics promote burning & must be kept away from direct flame & extreme heat source. If used in kitchens we reccomend Vetropoly™ toughened glass for cooktops to sit the width & height of your range hood. IPA Acrylic Splashbacks can be cut on site before install using standard woodworking & tile grinding procedures. IPA Acrylic is a bathroom renovators favourite (tilers) as all cuts & detailed work can be executed with a grinder. In Preparation of IPA Acrylic, there is no need to coat wall a neutral colour. Our IPA sheets do not need the back of the sheets sanded before placement on the wall. A clear neutral cure silcone in clear must be added in grid format to the back of the sheet to adhere to the wall. We suggest Parfix all purpose neutrel cure silicone for adhering & finishing seals. IPA Acrylic is available to all leading industry specialists; Hardware Stores, Home Improvement centres,Bathroom & Kitchen centres, Out door Home & Garden Centres or purchase direct on line call our office for more information. We have special builder packs reflecting our IPA colour range comprising of 12, 24, 36 & 48 sheets per pack. Nationally delivered all over Australia. SAVE ON BUILDER PACKS! 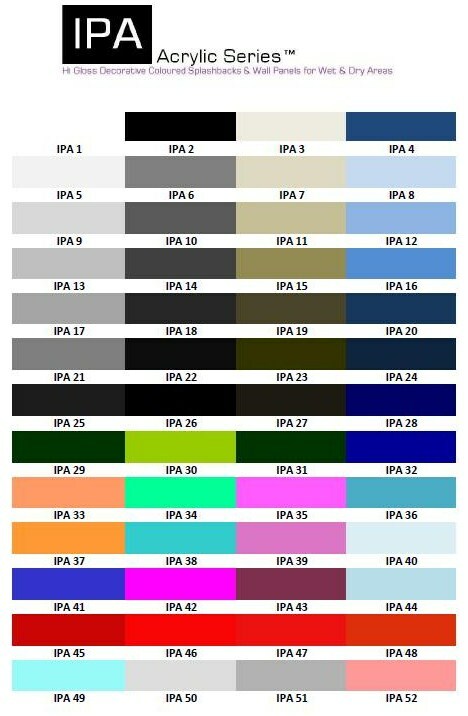 IPA Acrylic is available in 6mm in thickness. Note goods collected from a depo in your state should be collected in a reasonable time frame and not left in storage as they will not be covered for damages if they occur.